According to a new study sunshine might help you live longer and for some people the health benefits possibly outweigh the skin cancer risk of skin cancer. Researchers are suggesting that because people have become frightened of getting skin cancers they are avoiding the sunshine, but sunshine offers one of the best sources of vitamin D which protects the body from a number of diseases. Sunlight stimulates the body to produce vitamin D which has been proven to offer protection from some cancers, osteoporosis, rickets and diabetes. The scientists at the U.S. Department of Energy’s Brookhaven National Laboratory and colleagues at Norway’s Institute for Cancer Research in Oslo, say the health benefits from some sun exposure are far larger than the skin cancer risk. Lead researcher Johan Moan says modest sun exposure gives enormous vitamin D benefits and though certain foods contain vitamin D, the body’s main source is from the sun. The researchers have worked out that given the same amount of time spent outside, people living just below the equator in Australia produced 3.4 times more vitamin D than people in Britain and 4.8 times more than Scandinavians. They say even though rates of internal cancers such as colon cancer, lung cancer, breast cancer and prostate cancer are greater in the north than the south, people from the southern latitudes were significantly less likely to die from these internal cancers than people in the north. Richard Setlow of the U.S. Department of Energy’s Brookhaven National Laboratory, who worked on the study says current data provides a more information on the beneficial role of sun-induced vitamin D for cancer prognosis. Setlow says although increased UVB exposure may result in an increase in non-melanoma skin cancers these are relatively easy to cure and have very low mortality rates compared with the internal cancers vitamin D appears to protect against. Moan says for people living in countries such as Scandinavia where long winters and short days during the year limit exposure to the sun getting more vitamin D is critical to help the body’s immune system work properly. Moan has estimated that doubling the sun exposure for the general population in Norway would also double the number of annual skin cancer deaths to about 300 but that 3,000 fewer people would die from other cancers and he believes the benefits could also be significant for people in other countries. 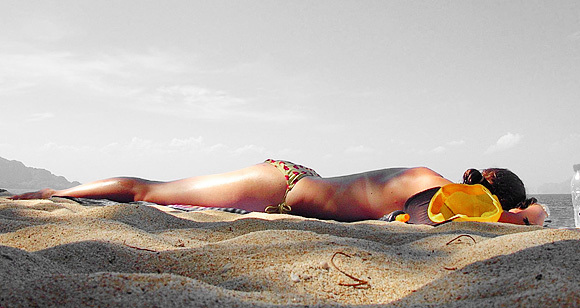 Moan recommends daily sun exposure for about half the time it takes a person to get sunburn; another way to access more vitamin D could be by designing sunscreens which block the long ultraviolet wavelengths that trigger the deadliest forms of skin cancer while letting through short ultraviolet wavelengths that produce the vitamin. Vitamin D is present in many foods such as cod liver oil and milk, and in can also be taken as a dietary supplement.